Macross is a show I've seen off and on, but I really have no idea what the overall story is or who are the main character, but it's a show I've always wanted to get into. Maybe with the release of these new spiffy Revolotech figures I might be motivated to watch the show if I make an investment with the figures. I'm glad to see Revolotech going back and making mech figures. They have been experimenting with human based figures, and while I love their Queen's Blade figures, their other anime based poseable figures just can't compete with Figma. 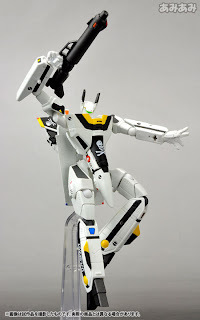 However, they wrote the book on poseable mech figures, so they are on top of their game when making these bad boys. Plus their figures have always been super affordable and look excellent to boot.